The Commission of Fine Arts (CFA) and the Citizens Coinage Advisory Committee (CCAC) have recommended designs for 2018-dated America the Beautiful Quarters and companion five-ounce silver coins. Overall, fifty-two designs were submitted for review. 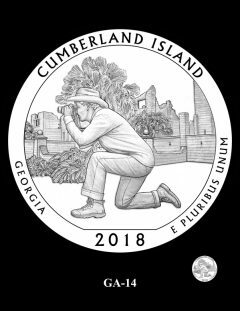 The CFA appraised them on June 16 and recommended five — one for each site honored. 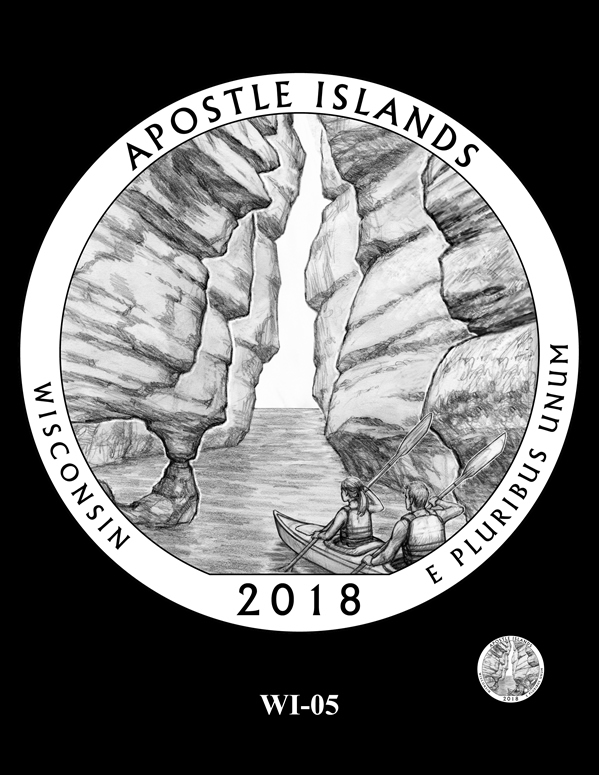 The CCAC looked them over on June 27 and selected four designs, asking for another round of candidates for Apostle Islands. To follow are images and descriptions of candidates for the five sites. CFA and CCAC recommendations are provided under the site titles. Thirteen designs for Pictured Rocks were reviewed. CCAC Recommendations: Members selected design #12. CFA Recommendations: Members selected design #8, which is also the preferred design of site officials. MI-01 depicts two people in sea kayaks exploring the waterways of Pictured Rocks National Lakeshore. 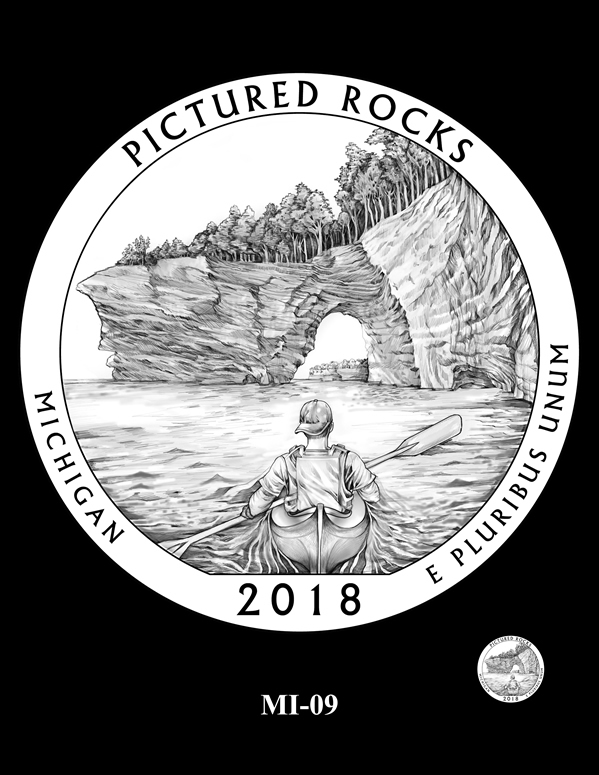 MI-02 features a man in a sea kayak paddling near Miners Castle. MI-03 depicts a stylized Chapel Rock and the white pine that stands upon it being battered by waves during a storm. MI-04 features a kayaker appreciating the beautiful mineral streaks that line the cliffs of Pictured Rocks. MI-05 and MI-06 depict views of Pictured Rocks. MI-07 depicts a robin, the state bird of Michigan, on a birch tree branch with the cliff walls in the background. MI-08 depicts Chapel Rock and the white pine tree that grows atop. This design was selected by the CFA and site officials. MI-09 depicts a kayaker paddling towards Lover’s Leap. MI-10 features a deer with the cliffs in the background. MI-11 depicts the point of view of a kayaker pausing to take in the sight of Lover’s Leap. 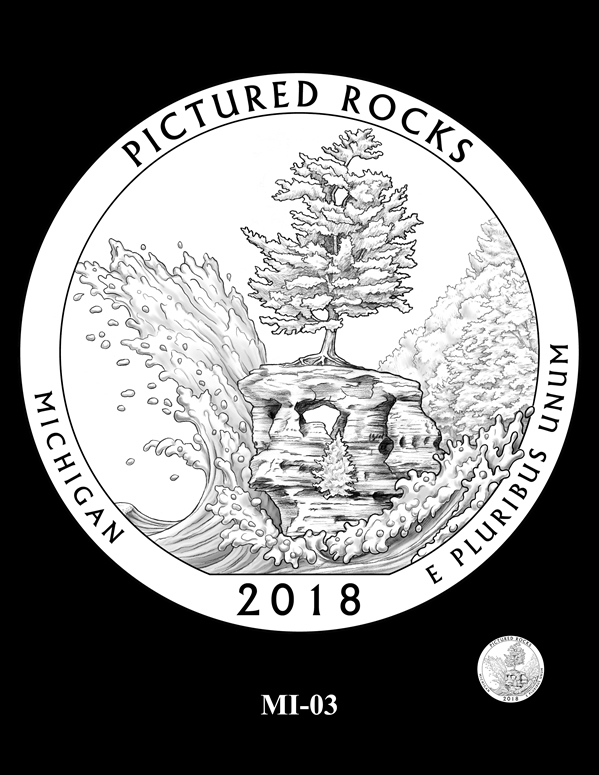 MI-12 depicts Chapel Rock with the white pine growing atop. This design was selected by the CCAC. 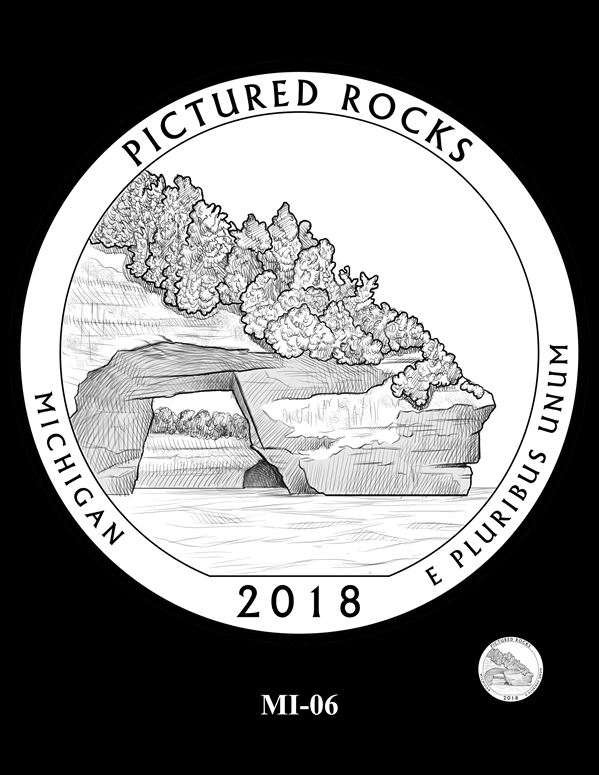 MI-13 features a view of the cliffs at Pictured Rocks. Nine designs for Apostle Islands were reviewed. CCAC Recommendations: Reverse #16 received the most votes individually, but there was confusion over voting for similar designs #4 and #4A. In the end, members passed a motion asking for a second series of designs to review. CFA Recommendations: Members selected design #9. It is also the preferred design of site officials. WI-01 depicts two kayakers paddling towards the rock formations at Devils Island. WI-02 features a kayaker gazing in wonder at the setting, with rock formations and a lighthouse behind him. WI-04 and WI-04A feature a sea arch topped with a variety of trees growing atop. 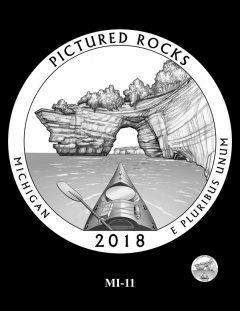 In design 04, a pair of kayakers paddles towards the arch. WI-05 and WI-05A feature a view into a crevasse in the sea caves. In design 05, a pair of kayakers begins to paddle towards the opening. 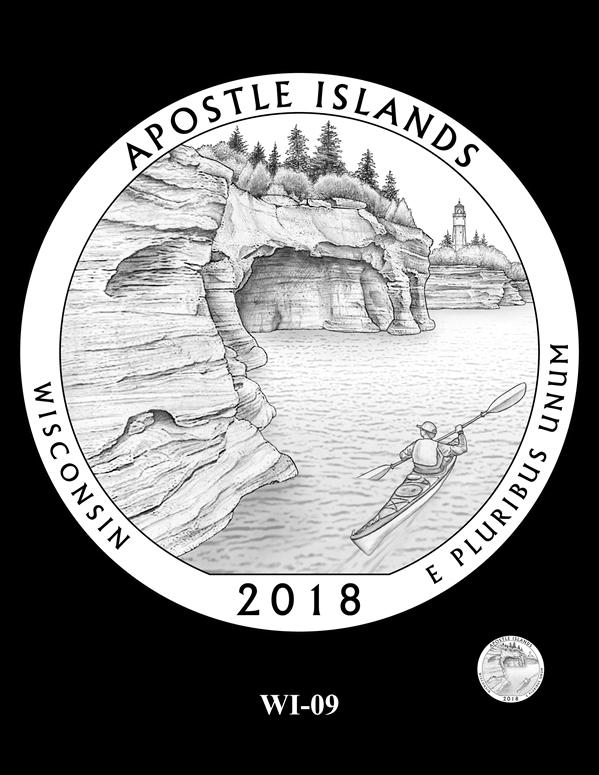 WI-09 and WI-10 depict the sea caves at Devils Island with the lighthouse in the background. In design 09, a kayaker paddles by. This design was selected by the CFA and site officials. Design 10 features the added inscription "Jewels of Lake Superior." WI-11 features a kayaker passing through a sandstone arch at Devils Island. Five designs for Voyageurs were reviewed. CFA and CCAC Recommendations: Members from both panels selected design #6, while park officials preferred #5. MN-01 depicts a campfire in a fire ring in front of a lake, with small islands in the distance and the Northern Lights visible in the sky. MN-03 features an eagle soaring above the interlocking network of lakes in Voyageurs National Park. 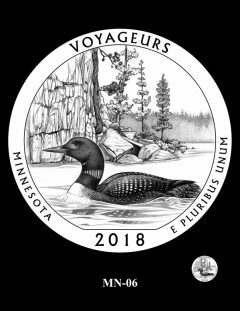 In its talons, it clutches a walleye, the state fish of Minnesota. MN-04 depicts an aerial view of Voyageurs National Park. MN-05 features a view of a few of the small islands found in the waters of Voyageurs National Park. Park officials preferred this design. MN-06 depicts a common loon with a rock cliff in the background. The CFA and CCAC selected this design. 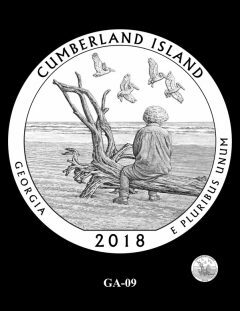 Thirteen designs for Cumberland Island were reviewed. Site officials liked design #1 the best. CCAC Recommendations: Members selected design #3, the third preferred design of site officials. CFA Recommendations: Members selected design #6, the second preferred design of site officials. GA-01 features an adult and young child walking through the Live Oak trees of Cumberland Island. Site officials preferred this design. GA-02 depicts sea oats holding the wind-shaped dunes while gulls fly overhead. GA-03 depicts a loggerhead sea turtle swimming along the undeveloped beach of Cumberland Island. The CCAC selected this design. 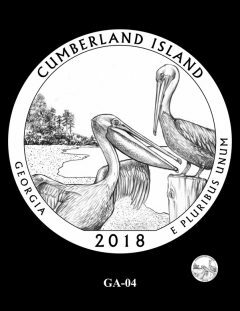 GA-04 features two brown pelicans on the beach of the island. GA-05 depicts a blue heron capturing a fish in the marsh waters along the western edge of the island. 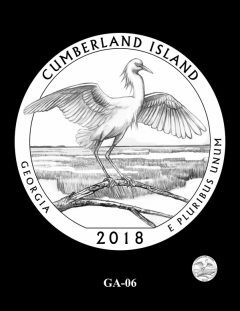 GA-06 depicts a snowy egret posing on a branch on the edge of a salt marsh, ready for flight. 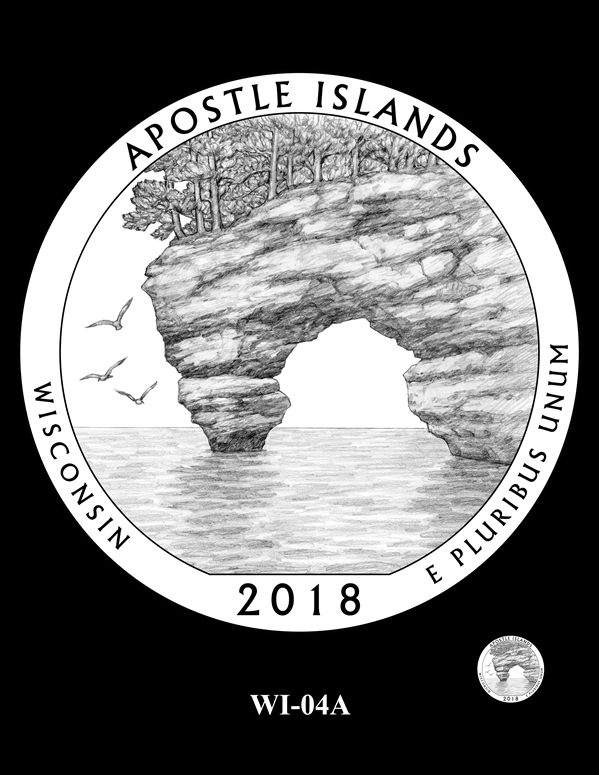 The CFA selected this design. GA-08 depicts a loggerhead sea turtle nesting on Cumberland Island. GA-09 features a quiet moment as a visitor enjoys the wind, surf, and abundant wildlife of Cumberland Island. GA-10 features a couple watching the sunrise over the Atlantic Ocean, the beginning of their day of shell hunting and exploration on Cumberland Island. 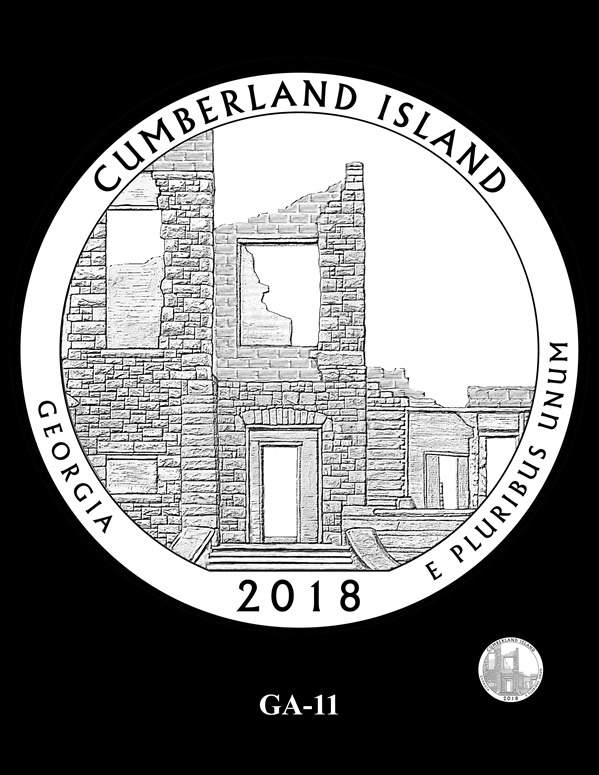 GA-11 depicts a close-up view of the Dungeness ruins. GA-12 features a photographer exploring the twisted branches of live oak trees and sand dunes that line the boardwalk path to the beach. GA-13 depicts a woman walking along the beach in the gentle wind while a sea turtle nests in the sand. GA-14 features a photographer exploring the flora and fauna surrounding the ruins of the Dungeness mansion. Twelve designs for Block Island were reviewed. 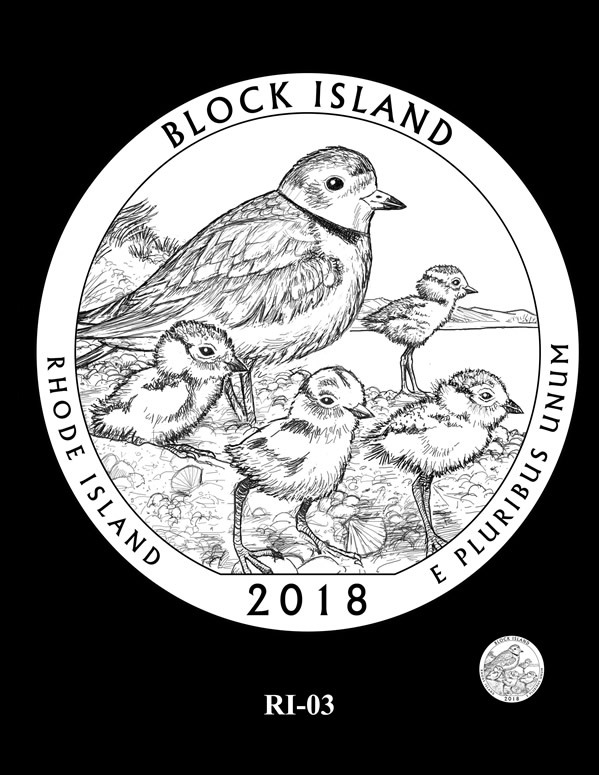 CCAC Recommendations: Members selected design #10, the third preferred design of refuge officials. CFA Recommendations: Members selected design #2, which is also the design liked best by refuge officials. RI-01 features a pair of piping plovers flying near the nesting areas on Block Island. Footprints form a path towards the North Light lighthouse. RI-02 depicts a black-crowned night-heron flying over a view from the beach at Cow Cove looking towards Sandy Point. The North Light lighthouse is seen in the background. This design was preferred by the CFA and refuge officials. RI-03 features a mother piping plover with four of her chicks. 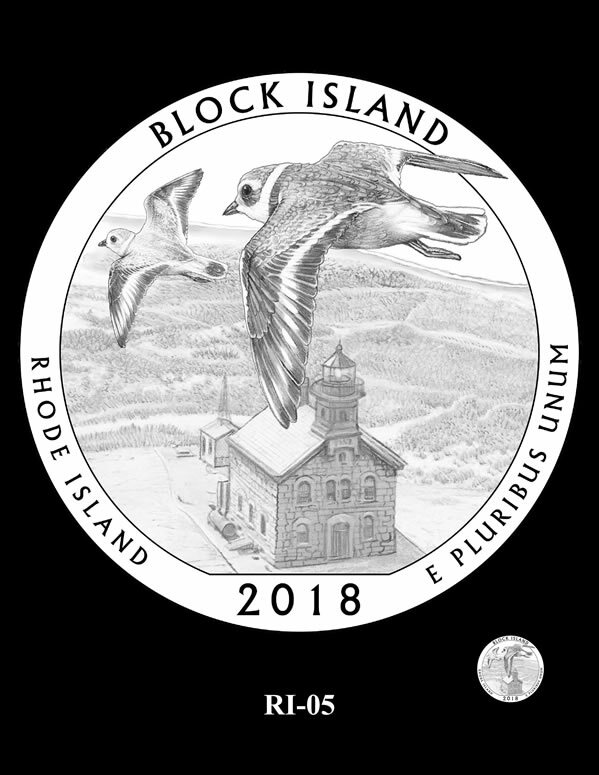 RI-04, RI-04A, and RI-05 feature two piping plovers flying over the North Light lighthouse. RI-06 and RI-07 feature a mother piping plover with her young on the shore in front of North Light. In design 07, two American oystercatchers fly overhead. RI-08 depicts a pair of common yellowthroat warblers over the rolling landscape with the North Light lighthouse in the background. RI-09 and RI-10 feature piping plovers on the rocky beach in front of the North Light lighthouse. Design #10 was selected by the CCAC. RI-11 depicts a piping plover being banded as part of conservation efforts to study migratory bird patterns. The Treasury Secretary is responsible for selecting final designs after receiving recommendations from the CFA, CCAC, U.S. Mint and national site liaisons. 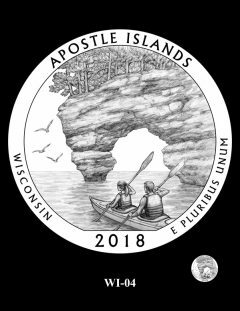 For information about past releases, visit our news section on quarters. Please keep the people and canoes out of the designs. They don’t belong there. I agree. 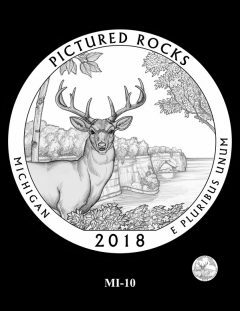 Some of these coins just don’t have any “class.” And some of the designs just look a bit too cheesy. 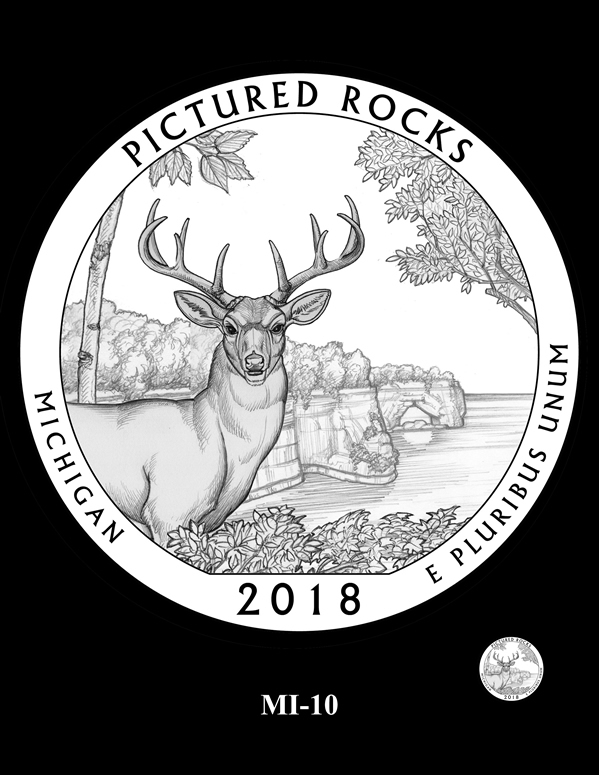 Maybe they will consider a bear, mountain lion, wolf, rabbit, skunk, opossum or maybe a porcupine on future coins to add something new. Maybe the inside of a cave could be done. Just my two cents. I agree with you, Barry. Those single turtles on two designs look so lonely by themselves on the design. One bird looks like it is choking & ready to throw up on the beach on another design! Another bird is being held against its will & having metal shackles put on its legs! Someone should call PETA immediately. 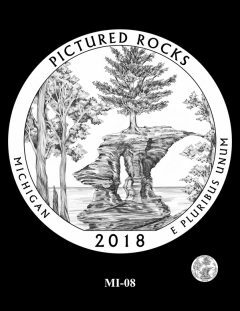 That tree growing on top of the large rock formation is awesome! I have to say that majority of these are absolutely great. I’m from Michigan, I know how canoeing is a popular recreation here so I have no problem with depicting it on the coin next to Pictured Rocks. 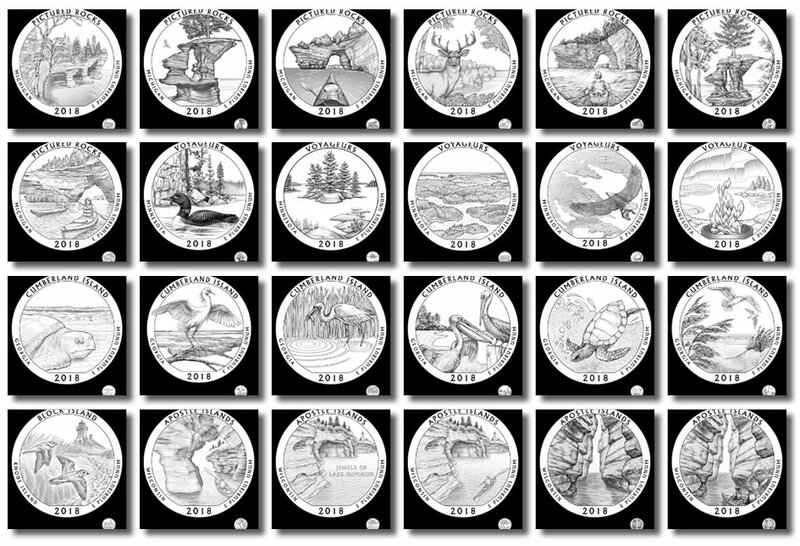 Remember Shenandoah quarter? Turned out to be a great looking design with the climber and the mountains. 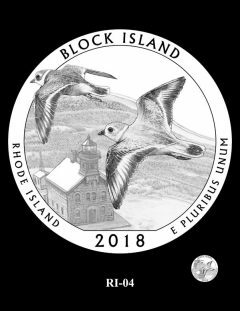 People from other states should voice opinions about their state’s designs. I do like the one with the bird whose wing extends a bit into the raised outer area of the standardized design area (GA-06). If selected, I wonder if the Mint will clip the bird’s wing rather than let it have sunken relief in that area. 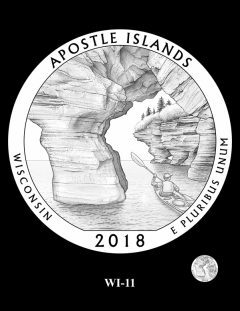 For that alone I would like to see that design made. I never thought I’d think this, but I long for the day of a straight forward quarter, no gimmicks, no controversy. Many interesting designs, but it’s getting a tad showy. I agree with you totally. That water bird with outstretched wings design is beautiful & well balanced & I hope it gets selected. 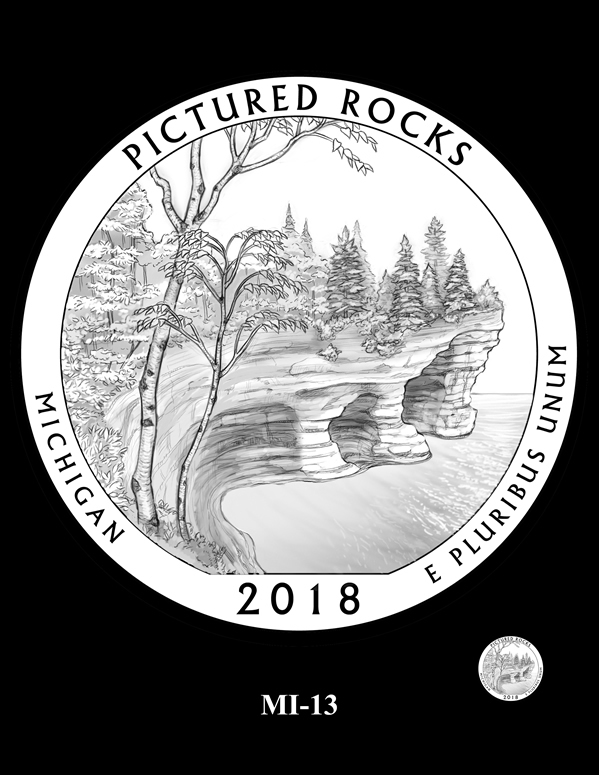 It may be the best of all the coin designs shown. Please keep us abreast on this situation. I resemble that Cheesehead remark there…eh? I say canoe, you say kayak, it’s a matter of semantics. Kind of like what the meaning of is, is. Is n’t it? 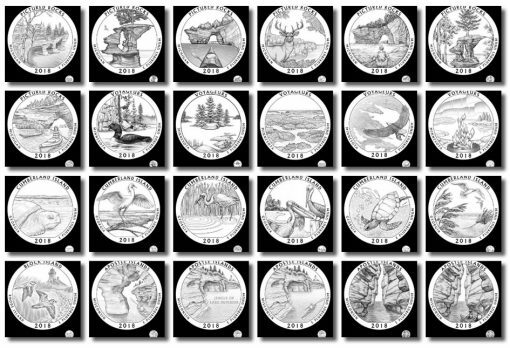 There are really nice looking designs on this set of coins. 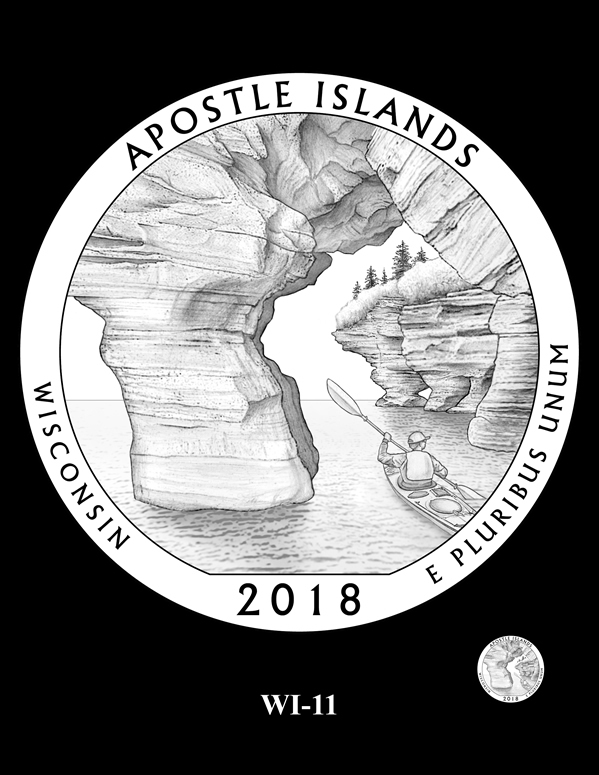 Hope I live to 2018 to collect one. 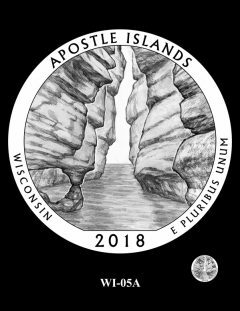 I just think Pictured Rocks and Apostles Islands look a little too similar to me. I like WI-09, if they just eliminated the dude in the yacht! Oh wait a minute, I mean the Kano-yak. And, Joe, just where is your mind at ??? I’m originally from Wisconsin, too, and I can’t believe a native cheesehead (that’s you, Jp) can’t tell the difference between a canoe and a kayak. 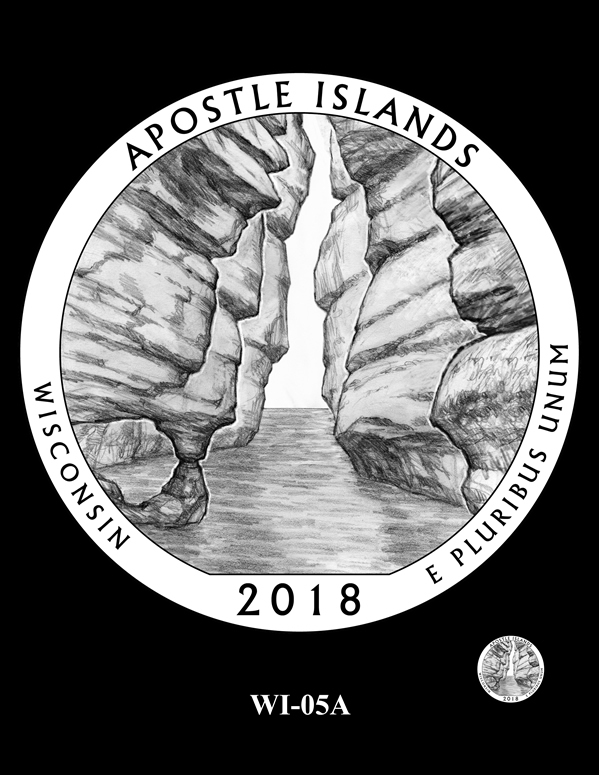 Also, having been to the Apostle Islands numerous times I can assure everyone that the shoreline depicted in the preferred design, WI-09, is scaled correctly. Those sea caves and cliffs are huge!! LOL. The Mint will limit the gold SL quarters to “one bare breast” per household! The news media will have a field day with this coin issue as they did back in 1916 getting the public riled up & making Lady Liberty wear a “bra”. How about a coin collector cruise in your yacht? For a 3-hour tour! I can’t top the Lady Li bra ty coin pun. I’ll take that cruise as long as MaryAnn comes along. I thought this was about the designs for the 2018 Pucs? How do we get off on these tangents anyways? As a kid I liked both MaryAnn & Ginger. I still think about their banana cream pies! Hard to believe Dawn Wells & Tina Louise are the only cast members still alive from that funny tv show. They actually used Hollywood paper money bills on that show when showing Mr. & Mrs. Howell with all their wealth. There is even a book about Hollywood screen money, which is very collectible. MidWEST girls are the BEST… Mary Ann (from Kansas) wins hands down! I agree Robert. I agree!! What is JP on the 5 oz america the beautiful. It is on the collar of George Washington. 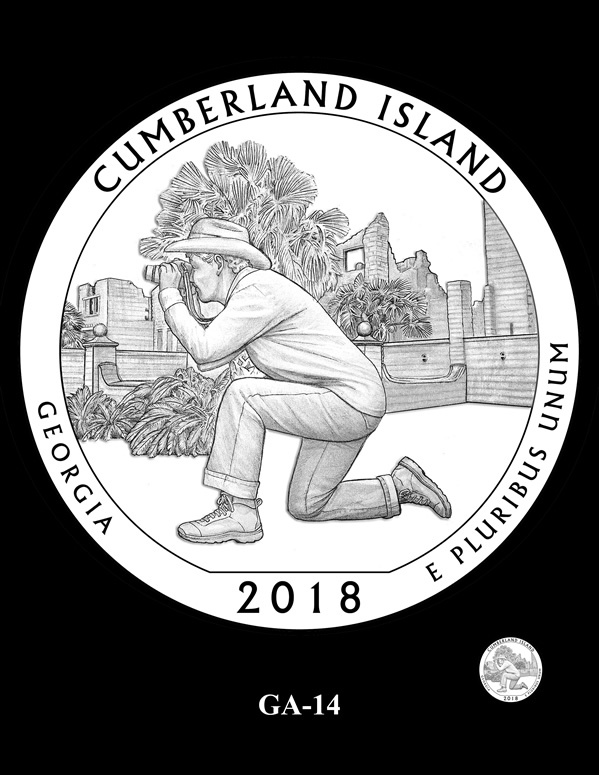 I am very disappointed in their choice for Georgia. Having seen all of the quarters released prior to this one, I really don’t think we need another one with a bird on it. A sea turtle would have much better represented Georgia. There are nests on every beach and we take protecting them very seriously. 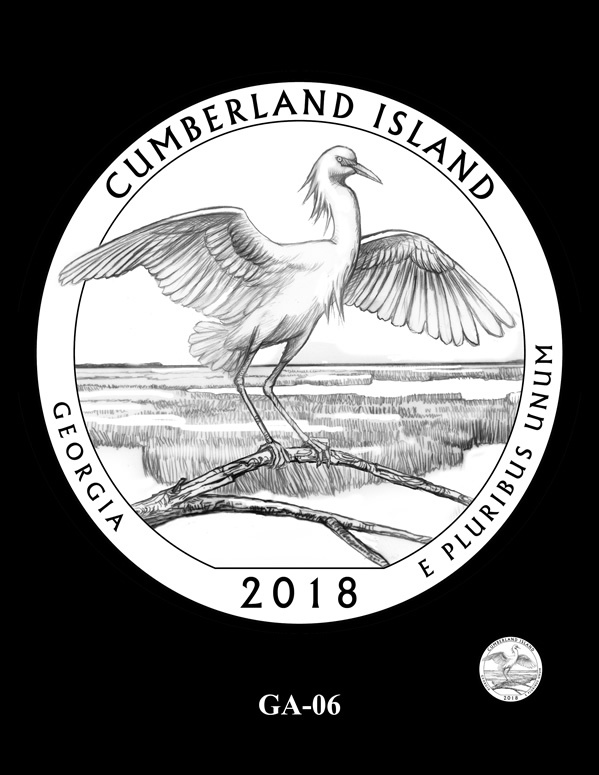 All of the bird designs are starting to look alike…..Everglades, Bombay Hook, Kisatchie and now Cumberland Island. 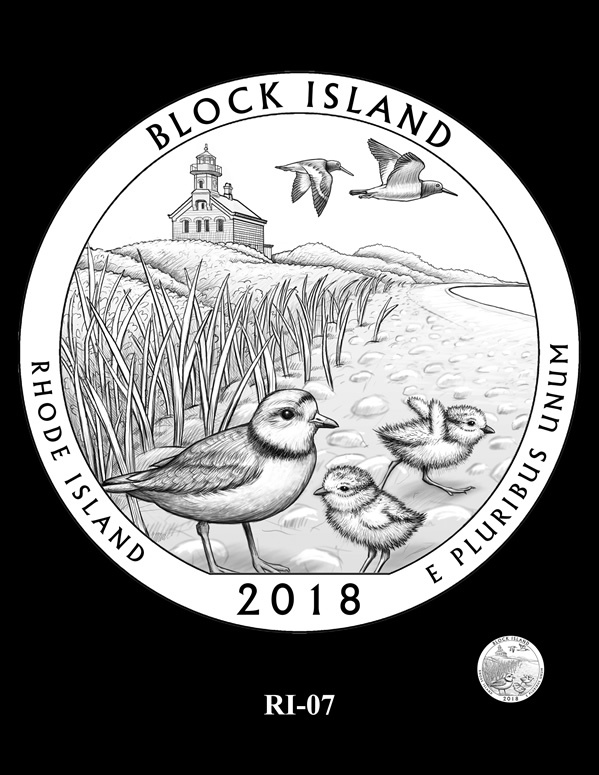 Someone on the team that chooses these has a bird obsession….. Some interesting comments, some inane thoughts. I agree that there seems to be a lot of similarity in some bird designs. 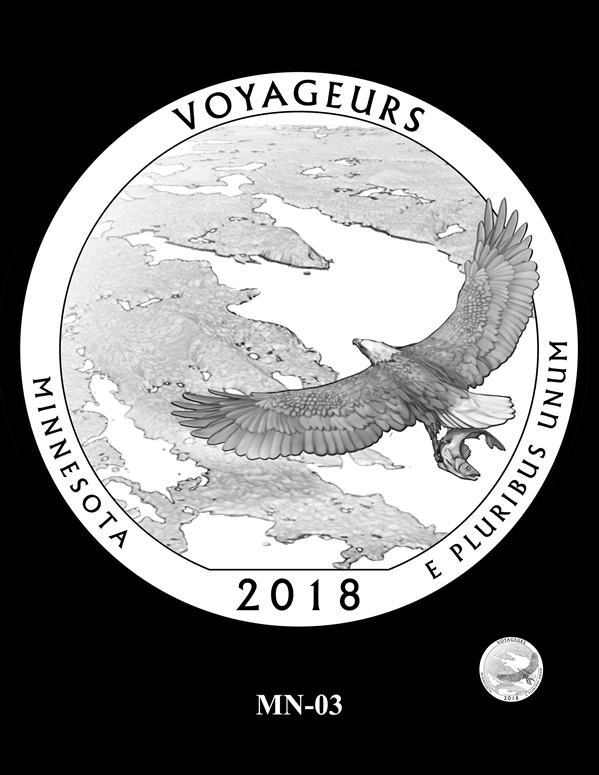 But I love incorporating history and art in our coins.